I was born in Montreal in 1944, the third boy in a traditional Jewish family. My two older brothers attended the local Jewish day school, but because they both contracted scarlet fever while there, my mother decided to change schools.. The school she chose was run by Chabad-Lubavitch, and that’s how my association with Chabad began. After a time, during a visit to New York, I asked the Rebbe for permission to transfer to the Chabad yeshivah near the Chabad Headquarters in Crown Heights. The Rebbe asked, “What were your marks?” I answered, “I don’t remember.” At that, the Rebbe laughed and said, “That’s a diplomatic answer.” But he gave me permission to transfer. So it happened that I was in Crown Heights when it came time for my Bar Mitzvah – this was in 1957. During my Bar Mitzvah audience with the Rebbe, he asked me if I knew how many strings were on my tzitzit, the ritual fringes. I answered, “There are thirty-two strings total.” The Rebbe then took out a piece of paper and wrote down the number 32 in Hebrew, using the letters lamed and beis. He then explained that this spells lev, meaning “heart,” and he blessed me to have a good heart, a warm heart, a Jewish heart. While I was studying in New York, my younger sister came down from Montreal for a visit. I took her to a farbrengen – a chasidic gathering led by the Rebbe – and she enjoyed it very much. After the farbrengen, I walked her back to where she was staying. Meanwhile, I missed the closing ceremony – kos shel bracha – when the Rebbe handed out wine from his cup. By the time I returned, I saw that the Rebbe had finished and was walking back up the stairs. I felt very bad that I missed kos shel bracha, so I went up to the Rebbe’s secretary, Rabbi Hodakov, and asked him if he could get a little bit of the Rebbe’s wine for me. Rabbi Hodakov agreed to see what he could do. I thought he would ask one of the chasidim, but instead he went to ask the Rebbe himself. He came back and said, “The Rebbe wants to know how come you weren’t there for the kos shel bracha.” I explained about my sister and he related that to the Rebbe. A few moments later I see the Rebbe coming out of his room with his cup of wine in his hand. He poured some of it into my cup and blessed me for success. It was just amazing to me that the Rebbe – who had spent many hours at the farbrengen and who was obviously tired – should do this especially for me. He was very considerate and thoughtful, and he was also amazingly insightful. During my early years in the Chabad yeshivah, I contracted a mysterious disease – my joints started aching terribly and, when the doctors examined the x-rays, they said that I had “ankylosing spondylitis” which is a type of arthritis resulting from inflammation of the joints of the spine. They said that my joints were fusing together so that, after a time, I would not be able to bend – I remember they said that I should decide whether to remain standing or sitting for the rest of my life, because that’s how it was going to be. One doctor suggested an experimental operation on the hip joint but, when I consulted with the Rebbe, he said not to do it. Indeed, it was good advice because, later, that doctor admitted to my father that this exploratory operation was very risky, and I might have been crippled for life as a result. As it happened, my spine and hips did not fuse together the way they predicted, although the pain persisted for many years. Although I didn’t understand the reference to “your financial situation,” it turned out the Rebbe was right – after a while, my disease went into remission, and I was fine. 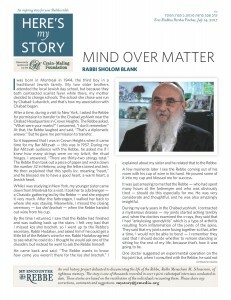 Recently, I got an insight into what the Rebbe might have meant. I read a book which explained that many physical problems have a psychological basis. For example, when people experience life traumas that prey on their minds, this can translate into back problems. Once they deal with these issues, the back problems disappear. As a young yeshivah student, I was a worrier, coming as I did from a family of worriers. My parents grew up during the Great Depression, and finances were always on the forefront of their minds. So, undoubtedly, I absorbed their worries. By the time I graduated from Chabad yeshivah and obtained rabbinic ordination, I was much less of a worrier. My worries were replaced by my trust in G-d, and the disease I suffered from went into remission. There is one more story I would like to relate from my time in the Chabad yeshivah. During the mid-winter farbrengen, the Rebbe used to give out bottles of vodka. I remember him holding a bottle and calling out, “Who is going to Montreal?” But nobody answered. He called out again, “Who is going to Montreal?” but again nobody answered. So, on the spot, I decided that this was my opportunity to get a bottle of vodka blessed by the Rebbe. I jumped up, “I’m going to Montreal,” I shouted out. The Rebbe reached out to hand me the bottle, and I stretched my left hand to take it. As I did that, Rabbi Jacobson shouted at me, “Take with your right hand!” His reaction was based in Jewish law, which says that the right hand represents kindness and, therefore, when you want to deal respectfully with someone, you always put out the right hand. But the Rebbe turned to him and said, “No. He puts his tefillin on his right hand.” The Rebbe knew that I was a lefty and that, for a lefty, the left hand takes the place of the right hand. You see, the Rebbe knew me. I was but one of his thousands of followers, but he knew me! As, of course, he knew each of his chasidim. Those of us who were fortunate enough to encounter him in person can testify that the Rebbe related to us on such a deep, personal level that we felt no one else in the world existed for him. Each one of us felt exactly the same – we all thought, “He is my Rebbe!” This is how he made us feel, and this was what was so amazing about him – that he saw into our souls and that he connected with us on the deepest spiritual level. Rabbi Sholom Blank is a Chabad Shliach in Miami, Florida, known for his expertise in the Jewish laws surrounding the building of an Eruv. He was interviewed in the My Encounter studios in November of 2016.